Rarely does such a dark cloud hang over a film. Fast & Furious 7 tragically lost lead actor, Paul Walker, mid-filming in November 2013. Not only did this have an enormous practical impact on the production (pushing the release date an entire year ahead), but emotionally, a series that thematically reiterates the importance of family, had to contend with mourning the loss of a loved one. Director James Wan and writer Chris Morgan adapted the story and, in consultation with cast and crew, ensured that Walker had a positive send off. Thankfully, this unfortunate situation is handled sensitively and with respect. Separately, the seventh instalment doesn’t live up to its predecessors. Introducing new characters who fail to match the engaging bad-boys of the past, it’s a surprise that even Jason Statham (introduced in Fast & Furious 6) doesn’t strike fear as others before. He’s almost mute, and seeks only revenge. A strong opening perhaps, but compared to Owen Shaw, Reyes and Braga in previous films, he doesn’t stack up – though he carries more grenades. The crew – noticeably smaller now – are tasked with saving hacker Ramsey (perfectly cast…) and taking down Statham. Kurt Russell and Djimon Hounsou support, but again, they lack character and fail to ignite any urgency or passion to our favourite team. 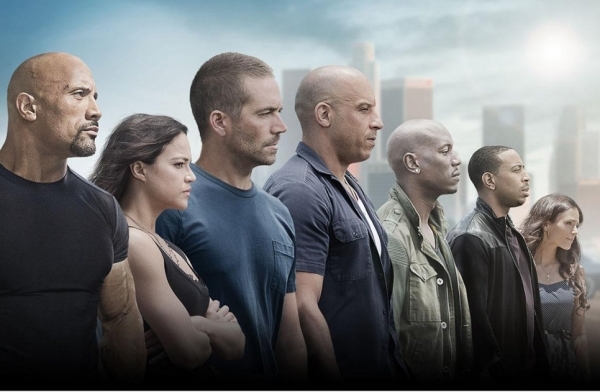 Fast & Furious 7 showcases incredible stunts (Impressively requiring little CGI), and bids goodbye to Paul in a heartfelt manner – it’s just a shame the new guys pull the breaks on such a strong franchise.